The Minus 5 on tour! Yes, really. 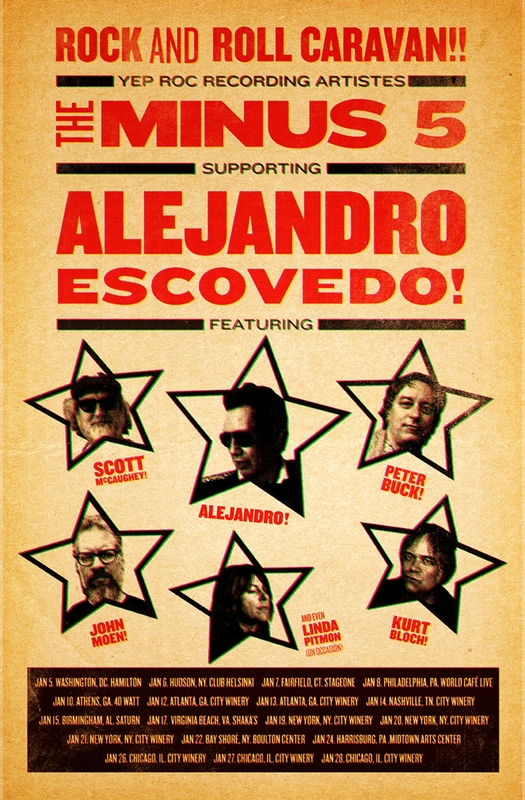 Cleverly disguised as the mighty Burn Something Beautiful band - you may have just seen us on Austin City Limits -- we will open each show of Alejandro Escovedo's upcoming January tour. So you'll get Scott McCaughey, Peter Buck, Kurt Bloch and John Moen (replaced on the drum throne by Linda Pitmon at the first four shows) presenting a brief retrospective of M5 classics and not-so-classics. Either way you win. After that the four of us will turn into butterflies, and back Alejandro on smash hits from his/our latest on Fantasy Records. A splendid time is guaranteed for all, and we really do hope to see you out there!